Welcome back! 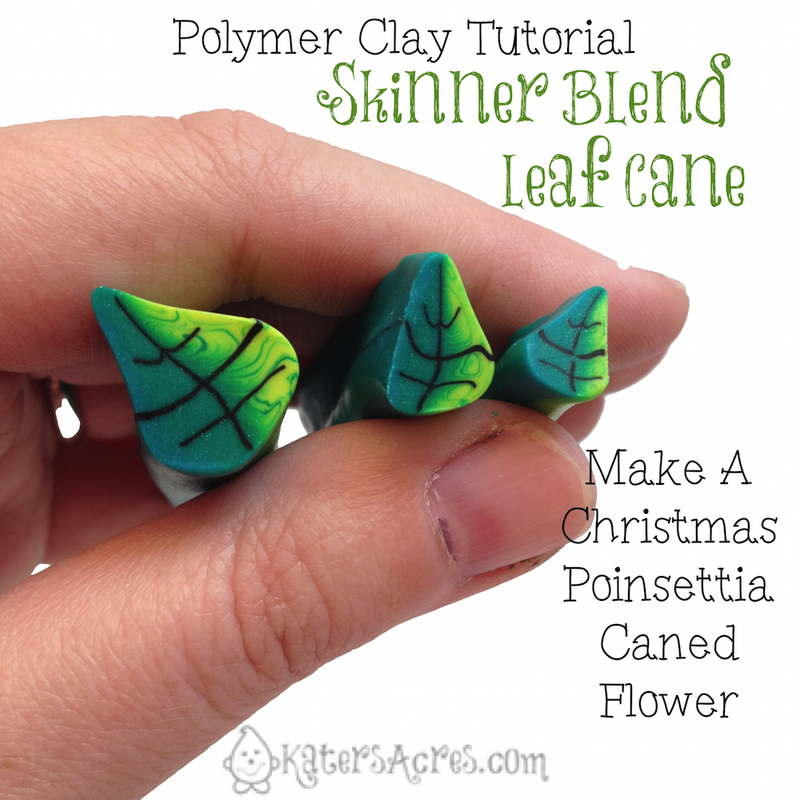 This tutorial is part 2 for the caned poinsettia project. You can find part one here. There are lots of different ways to make a leaf cane, I can think of 4 different ways off the top of my head. I made this leaf cane the way shown in this tutorial because I wanted the gradient side portions. Most of the details are an exact copy of the way you completed your petal canes for the first part of your tutorial. 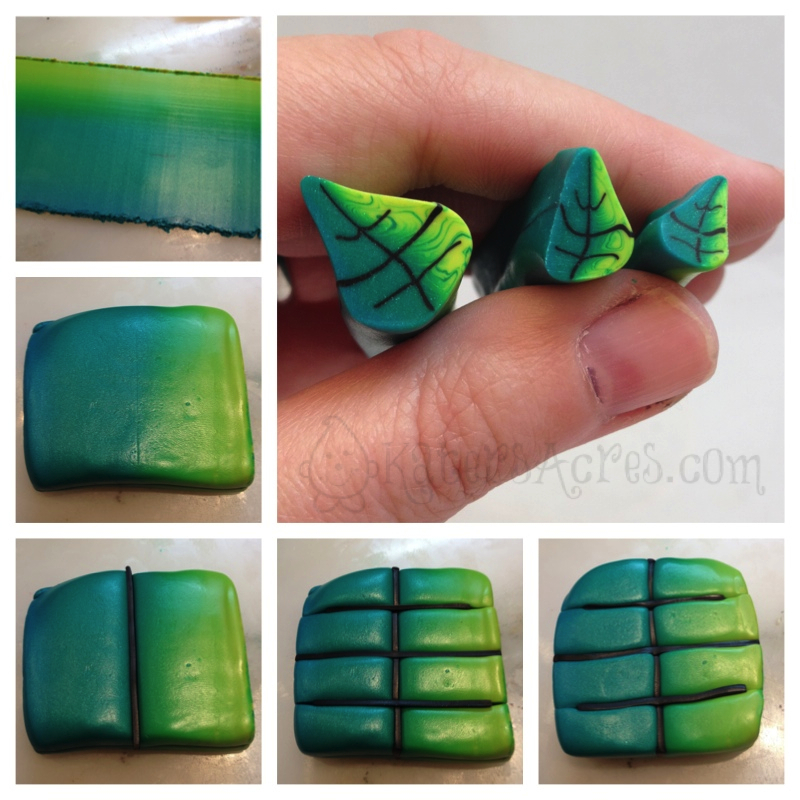 Here is another example of how to make a leaf cane here that you could also use for this project. First, you need to make a long skinner blend, see PART 1 for details on how to do this with your leaf colors. Once you have your block, divide the block in half. NOTE: Decide which gradient you want where first and divide accordingly. i.e. : If you want the bottom of the leaf cane to be light, you will need to turn the block and divide it opposite the way shown. Insert a strip of your 3 color of clay into the middle of your block. Now smoosh those two halves back together. Add the “veins” in by divide your block the opposite way as many times as you would like there to be veins. NOTE: There is no need to “overdo” the veins as you are going to cut, pinch, and form these leaf canes into leaves. So the less details the better in this case. As shown in this tutorial, shape your block into a round cane. Once you have the first size leaf, chop a portion of your cane off and keep it. This will make your big leaves. Reduce your cane as many times as you would like, making as many different sized leaves as you would like. Cut and trim your canes as needed to keep them from getting too “wonky” – but don’t throw the parts away, we’ll use them later.